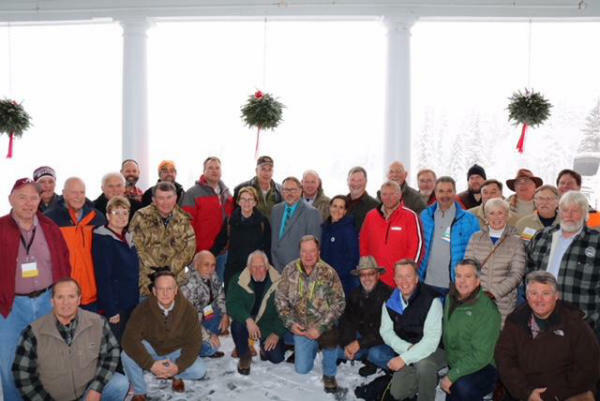 (Bretton Woods, NH) - This week, nearly 50 bipartisan legislators from more than 25 states gathered in Bretton Woods, New Hampshire for the 15th Annual National Assembly of Sportsmen's Caucuses (NASC) Sportsman-Legislator Summit. Hosted by the Congressional Sportsmen's Foundation (CSF), this year's Summit theme was "Enhancing Access and Opportunity for America's Sportsmen and Women." Among the several issues that were focused on access were: Pro-Fishing Access Legislation; Unique State Land Access Programs; Promoting Access through Conservation Easements; and An Evaluation of State Incentive Programs for Habitat Management and Hunting on Private Land. Sessions that were focused on increasing opportunity included: College Student Hunting and Angling Licenses; Conserving Fish and Wildlife and Creating and Protecting Opportunities for Access for the American Public; and Prevention of Unnecessary Lead Fishing Tackle Bans. At the end of first day, Steven Rinella, host of the MeatEater, addressed attendees during the evening reception and dinner. During the Summit, CSF's States Program Team recognized several individuals and groups for their dedicated support to NASC. The 2018 NASC Executive Council was also announced. Leadership includes Sen. Bill Heath (GA) (President), Rep. Brian White (SC) (Vice President), and Rep. Jeff Goley (NH) (Secretary). Members include: Del. Wendell Beitzel (MD), Sen. Mike Bell (TN), Rep. Scott Bounds (MS), Rep. Patrick Brennan (VT), Rep. Regina Cobb (AZ), Rep. Bill Rehm (NM), Rep. Jeff Wardlaw (AR), Sen. Robin Webb (KY), and Rep. Brad Witt (OR). Alternate members include: Rep. Jerry Costello (IL), Rep. Mark Neuman (AK), and Rep. Jerome Zeringue (LA). In closing, New Hampshire Governor Chris Sununu, Governors Sportsmen's Caucus member, thanked attendees for their dedicated efforts on promoting and advancing hunting and fishing policies. "Hunting licenses are slowly trickling down. We need to invigorate this with programs in public schools, teaching hunter education and conservation values," said Gov. Sununu. "These are bipartisan issues, so they can be solved and achieved from a regulatory and funding standpoint." Title Sponsors included: Bass Pro Shops; Cabela's; National Shooting Sports Foundation; and Safari Club International. Host Sponsors included: Charter Communications; Federal Premium Ammunition; and National Rifle Association.